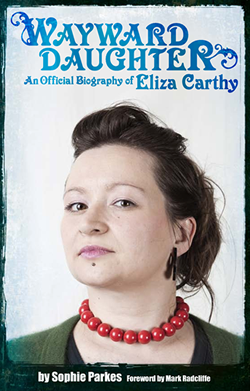 Eliza Carthy is a modern English musician. Since appearing at the Vancouver Folk Festival aged just thirteen, Eliza has sung and played across the globe, recording critically acclaimed albums – including Red Rice and Anglicana, which were both nominated for the Mercury Music Prize – and collaborating with a whole host of movers and shakers including Paul Weller, Cerys Matthews, Richard and Teddy Thompson, Billy Bragg, Stewart Lee and Patrick Wolf, amongst many, many others. She is the Wayward Daughter of Martin Carthy and Norma Waterson, giants of the British folk scene. In this official biography, released on May 9 courtesy of Soundcheck Books, Sophie Parkes discovers how Eliza came to inherit the family talent and continue the family trade: reinterpreting, reimagining and renovating English traditional music, and grounding it very much in a modern day experience.